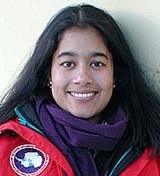 Dr. Aparna Sreenivas is an Assistant Professor of cell and molecular biology in the Division of Science and Environmental Policy at California State University Monterey Bay. Dr. Sreenivas use molecular techniques to study harmful algal blooms in freshwater environments in the Monterey Bay Area. She co-directs the Molecular Ecology Lab at CSUMB. Dr. Sreenivas's research team is particularly interested in environmental drivers spur CHAB formation, the level and persistence of cyanobacterial toxins in freshwater environments, and the composition of cyanbacterial species in freshwater lakes in the Monterey Bay region.